Fish have been on the earth for more than 450 million years and were well established long before dinosaurs roamed the earth. Fish is a good source of protein, low in saturated fat, and filled with omega-3 fatty acids which are good for the heart and brain. Populations that eat fish regularly live longer and have less chronic disease than populations that do not. Recent research suggests that supplementing the diet with omega-3 fatty acids not only can reduce these risks but can also help treat depression, bipolar disorder, autism, and attention deficit hyperactivity disorder. Fish is, indeed, a brain food. We have been shooting, eating and posting images to our flickr site in the hope that we can tap into photo libraries and publications buying our images. We realised if New Zealand based companies wanted our images we needed more New Zealand stuff which is why we decided to tackle fish for this food fight. We are blessed to live very close to beaches both East and West coast and and you would think that fish would be plentiful. Fish is of course available, however New Zealand fish is expensive. 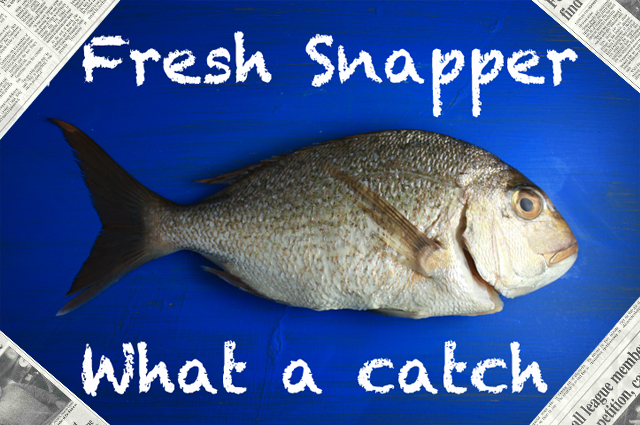 A fish we remember as kids and our parents too is Snapper. Our Mum remembers her father after work taking the dingy out and catching a bucket load for dinner. Today its a day event, usually chartering a boat for a hefty fee and there is never the guarantee of anything never mind the prime snapper. Snapper used to be de rigure at the fish n chip shop, now is the premium option battered or crumbed for a tidy $6-8 dollars per piece. 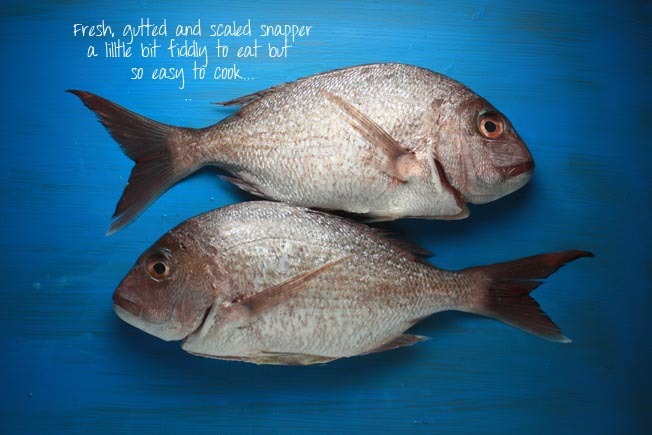 Snapper fillets are usually $30 - $35 dollars per kg! Maybe chartering the boat isn't such a bad option! Whenever Ingrid and I come up with an idea we are both itching to get started. With work and kids its often difficult so when I decided to drive tired Jake around the place looking for the perfect fish to shoot I opted for the most convenient option, a gourmet supermarket en route home. At the local mega supermarket the previous weekend, I noticed lots of interesting types of fish both whole and fillets so thought a gourmet supermarket will also stock the range however the price will be ridiculous. How wrong was I! They had fillets of white fleshy fish, large tiger prawns, Morten bay bugs, scampi, fish roe, salmon, oysters and even paua. 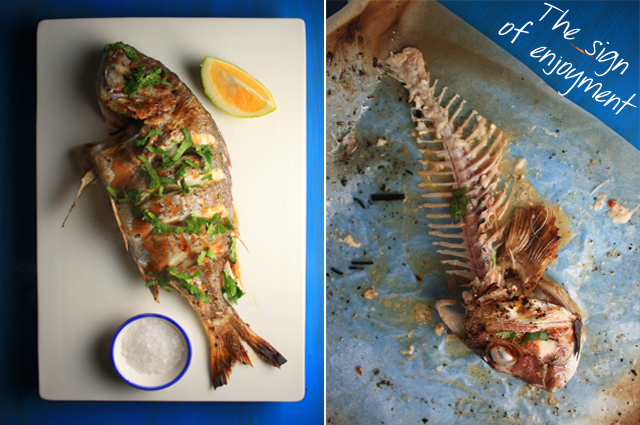 Where were the ice-trays of glistening and shiny whole fish? Me: 'Have you got any whole fish?" Fishmonger: "HUH whole fish, we don't usually do whole fish here"
Fishmonger: "You are on the North Shore love, the people here want fillets"
Fishmonger: " Its your lucky day though, we have a few baby snappers if you want them"
Me: "Are they fresh?" (I laugh at this question as of course he's going to say yes even if its not!" Me: "OK just one please"
Me: " Make it 2, I feel sorry for the one left behind"
So I walk out of the shop with 2 baby snapper in a fancy gourmet supermarket bag and $20 lighter in the pocket and a grizzly child. The plan - early to bed for Jake so I can cook, shoot and eat. Score the fish on both sides (deep cuts) This makes it look good, shortens the grilling time and gives you a look in to see if its cooked. Place on baking paper and drizzle with olive oil and sprinkle with seasoning/salt. 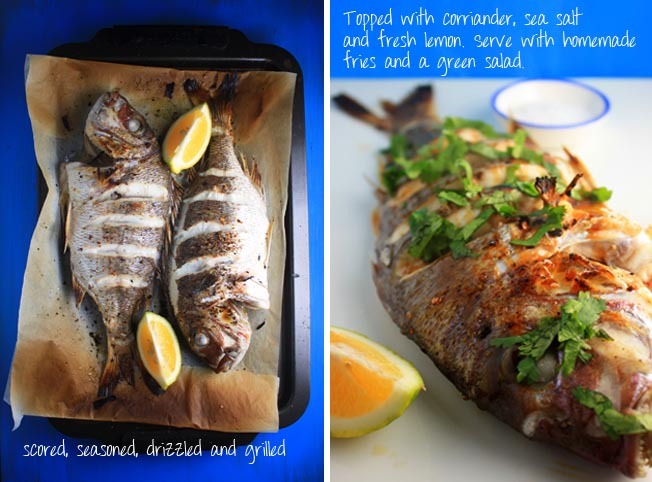 Turn the grill on and when its hot cook the the fish for about 5 mins on a tray close to the element. When its brown and cooked through, gently turn and do the same to the other side. When cooked, transfer to serving plates and squeeze lemon juice on to the fish, drizzle with oyster sauce and sprinkle with chopped coriander. Suggestion -You could warm the oyster or soy or chili sauce and serve as condiments on the side. Eat one side first, off the bone but be careful of the small bones. When done remove the entire bone and discard and start on the second side. If you are game like Lewis, tuck into the head too! Before and After - be careful of the bones! I second that , just need a new BBQ!! !